Lexus LFA 'a monster' | What Car? 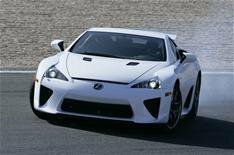 The Lexus LFA has been branded 'a monster' by the new chief of rival firm Honda, Takanobu Ito. The supercar was unveiled at the Tokyo motor show last week. It's powered by a new 4.8-litre V10 that develops more than 550bhp. The top speed is quoted at more than 200mph. It goes on sale in 2011 for 340,000 and just 500 will be made. However, Ito, who worked on Honda's last supercar the NSX, isn't impressed. 'I would love to see us develop another one [supercar], possibly as a green supercar,' said Ito. Click on the link for the full Takanobu Ito interview.